Create Aliases on OS X and Linux for Faster Work on Command Line – Like You Can Configure the key c for clear command on Terminal or iTerm2. This sounds nice as we no longer will need to use tar -xzvf like bigger commands. We are using iTerm2 on our MacBook Pro running OS X 10.9, well the things are same on any *nix system. But, you must must read iTerm2, Homebrew and ZSH Installation on OS X and Can Not Find .Profile File if you are using OS X. Can Not Find .Profile File OS X is a frequent complain. Also, you need to understand what is Symbolic Link. If you have no idea about what you are doing, specially for OS X, BSD like Pure UNIX breeds, kindly read our older articles on what is terminal, what are workstation, actually we are running the same UNIX on iPhone with which human went to moon. You must have a clear idea about UNIX Shell. Without having a clear idea and executing command can end up in no boot on restart. Please note that, if you are running Linux on a machine intended for running MS Windozzzz, keyword mapping can be different and this ' might become something else. Be careful. This Article Has Been Shared 6109 Times! 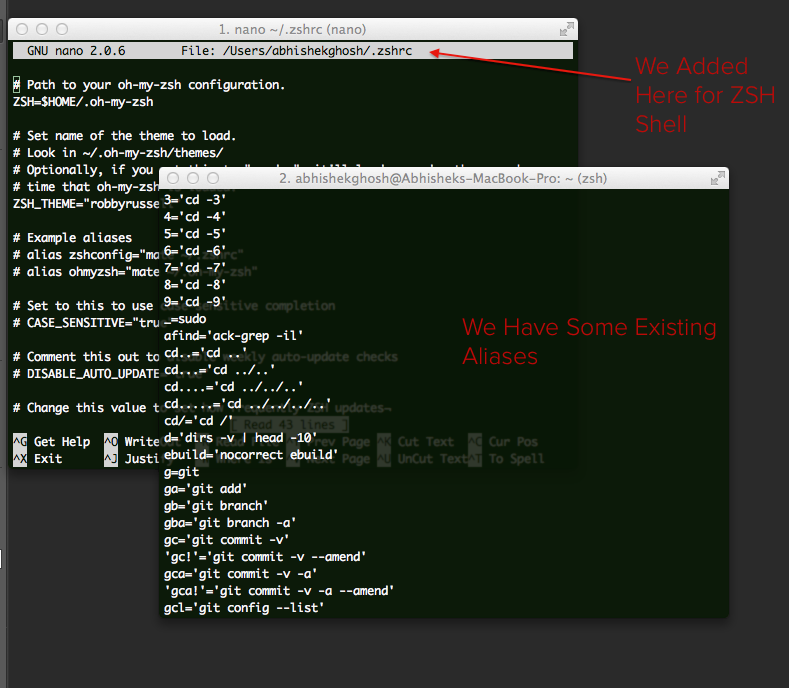 Cite this article as: Abhishek Ghosh, "Create Aliases on OS X and Linux for Faster Work on Command Line," in The Customize Windows, May 8, 2014, April 23, 2019, https://thecustomizewindows.com/2014/05/create-aliases-os-x-linux-faster-work-command-line/.